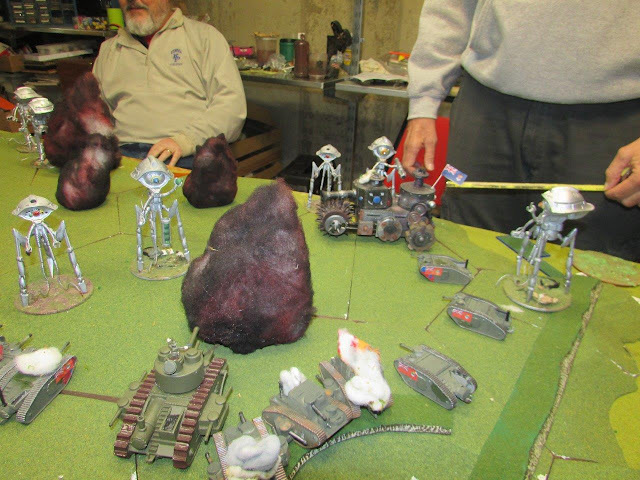 All Quiet on the Martian Front: Episode V America Strikes Back! It is a dark time for Marvin’s Martians. in the location of a previous cylinder fall. but the on board equipment was left intact. of Tuscarora, Mohawk, Oneida and Onondaga Indians. 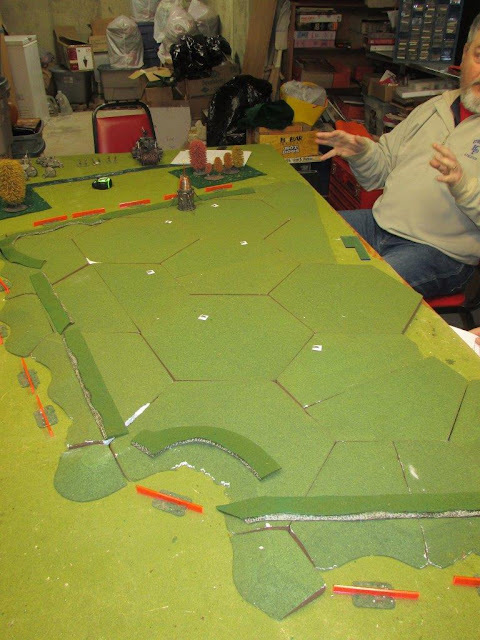 Scenario: A variation of Scenario 10, The Redoubt. Players: Garth Parker and Mark McConnahay : American Armored Forces Midwest. Bruce Potter and Phil Gardocki: Marvin's Martians. 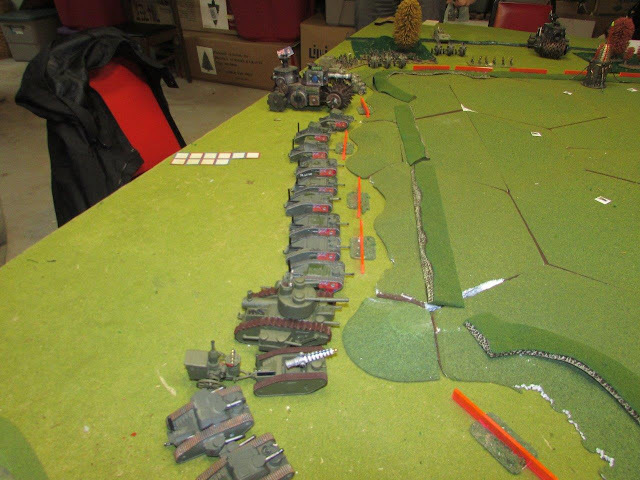 The Forces: The American Armored Forces Midwest: 5 platoons of tanks, Mk II's and III's. 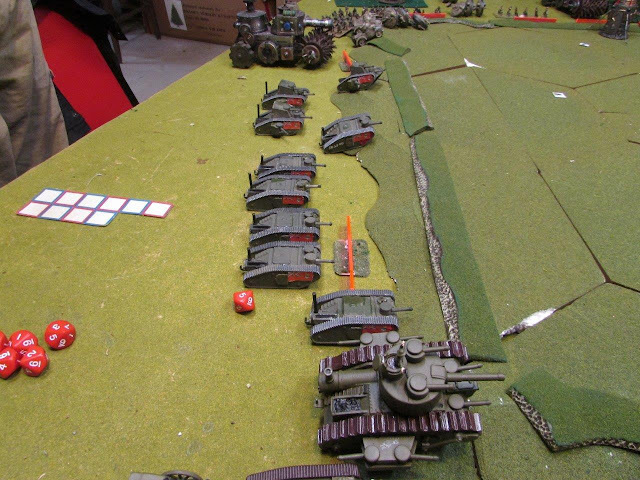 6 companies of infantry and machine guns, a Mk IV, and a Tesla Gun. About 1,600 points. 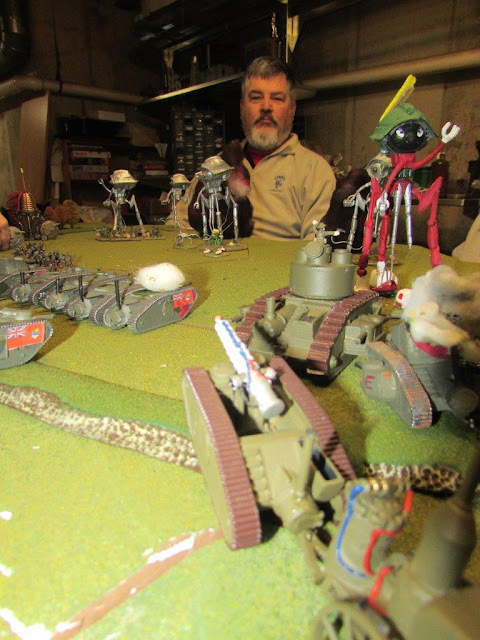 3 Canadian Land Monitors, and the Canadian Mounted Squadron for 660 points. The BEF, 5 infantry companies, a troop of Defiants, and a coil gun for 850 points. Marvin's Martians: A total of 15 (still active) tripods, 10 Assault, 3 Scouts, a Scientist and a Slaver, supported by 9 Drones. About 3,000 points. The House rules are at the end of the battle report. Humans have achieved strategic surprise in their assault. 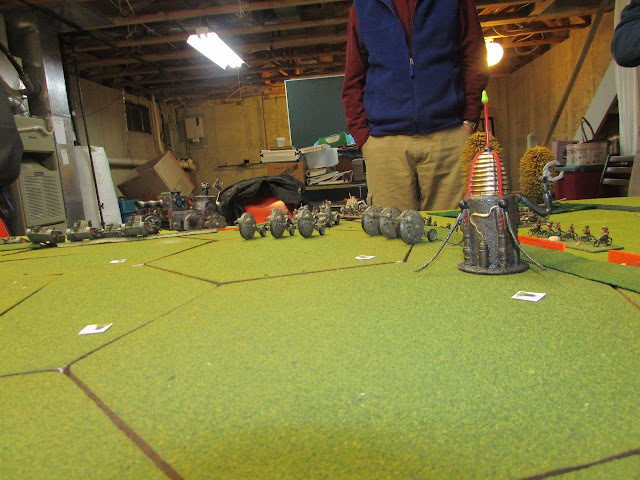 They move first each turn until the Martians are alerted to their presence. The Martians are alerted when any noninfiltrating human unit of touches the redoubt, or a heat ray fencing or constructor is attacked, or reacts to a unit in contact, or are discovered by a roaming Reconnaissance Tripod. After that, initiative is determined normally. Only the Marian Constructor and Heat Ray Fencing is initially deployed. 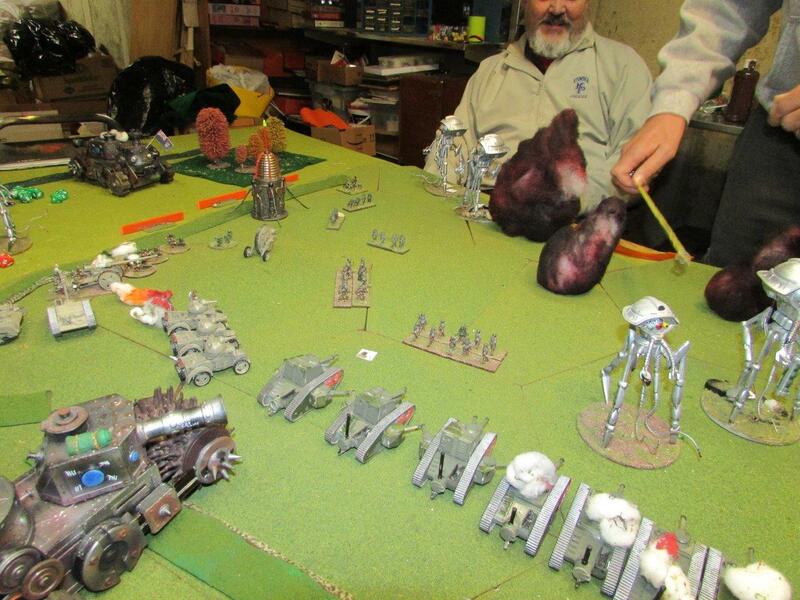 Martians then enter the board through unmarked gates within the redoubt randomly. 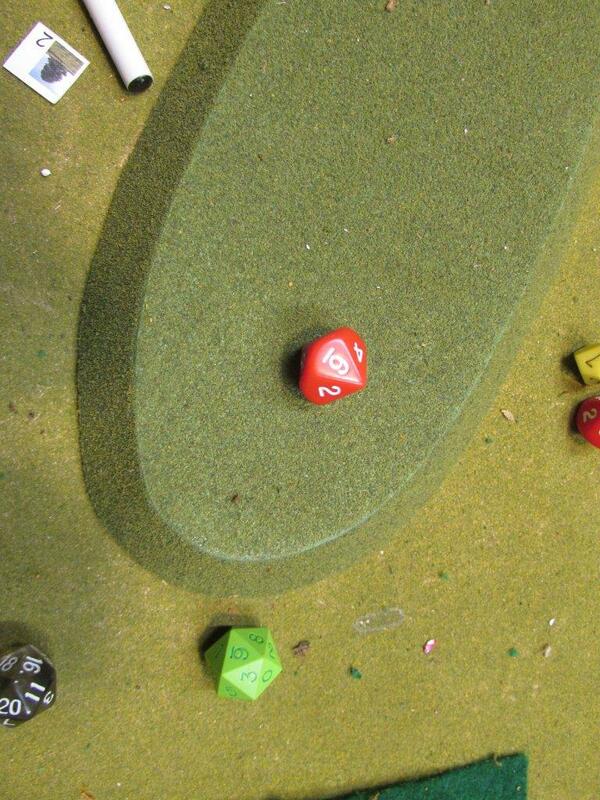 Thereafter, roll a die, adding 1 for each turn after they are alerted. 1-3, 1 tripod rises up and can fight. 4-6, 2 tripods rise up and can fight. 7-9, 3 tripods rise up and can fight. 10 4 tripods rise up and can fight. 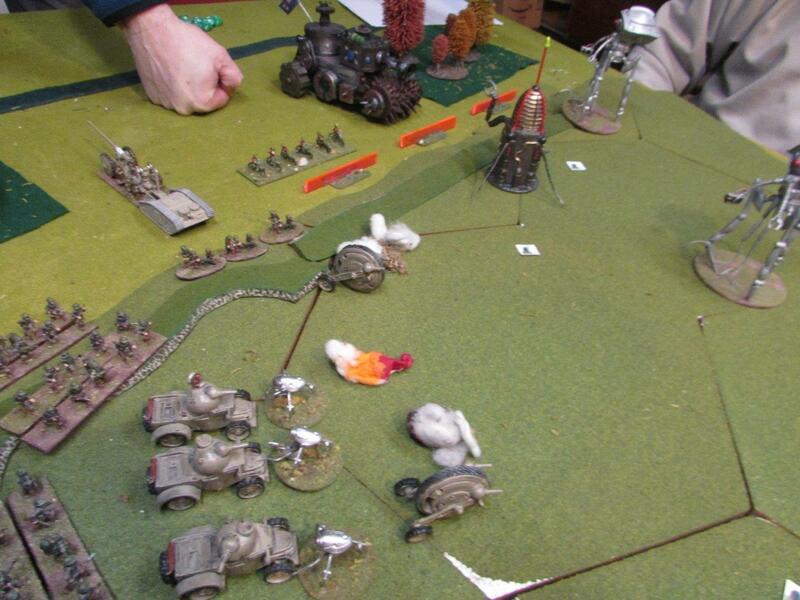 Also, starting on turn 2, the Martians roll a die for a roaming Reconnaissance Tripod. A successful roll is 1 or 2 on turn 2, and increments by 1 per turn. If the Reconnaissance Tripod discovers any human presence, the hive is alerted and Martians are alerted and will react starting immediately. I.E. the same turn. Martian drones do not require a controller while in the hive. The Martian Break point is 9. 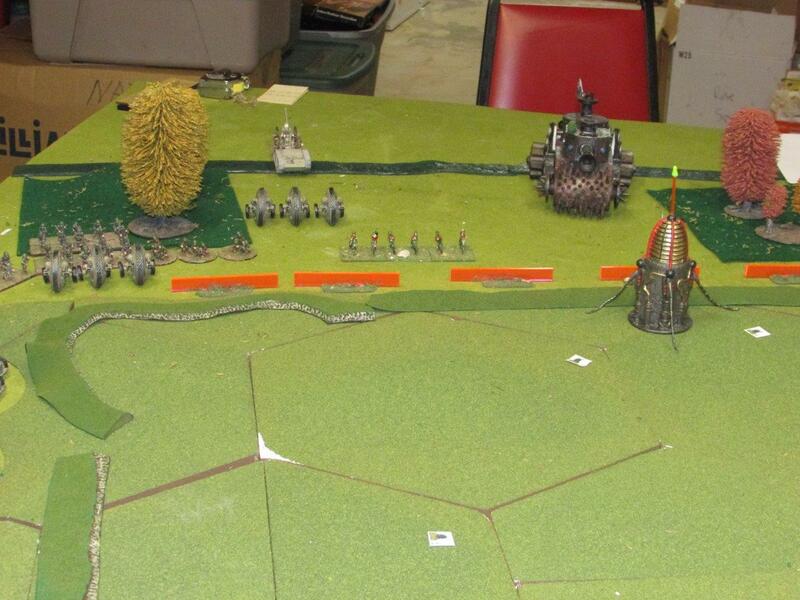 The Americans have infiltrated the hive area with 6 units of infantry and machine guns. Infiltrators are represented by chips until revealed. They may not move till revealed. The remainder of the Americans come from any 3 of the 4 board edges and drive on to the hive. Americans can keep any number of units in reserve. They are brought in on 3 of the 4 edges under the Reserve rules (pg. 69). No die roll is required. As the Americans are attacking in some remote wilderness area outside of rail range, The American Industrial Might Rule is not in effect. The Americans have a breakpoint of 15. 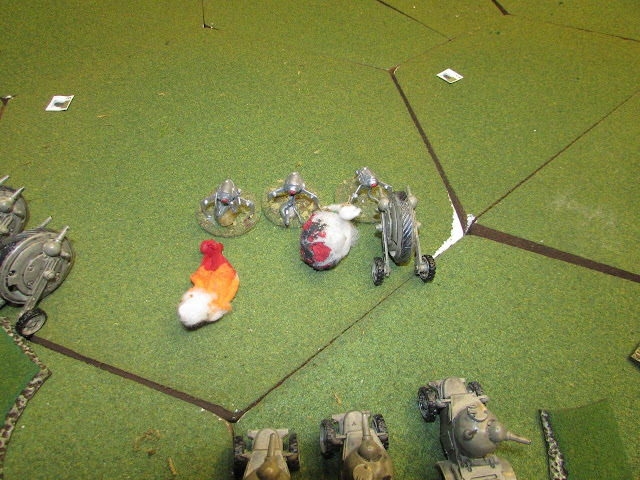 The heat fencing destroys any unit that touches it. Heat Fencing can be shot over and through. The area inside the redoubt is open terrain. The area inside the redoubt is actually a depression. Units inside the redoubt cannot be seen from outside and visa versa. Nothing special, break the enemy. It was nearly midnight, and General McIntyre, DSM, sat at his desk, dealing with his correspondence. Most of the official paperwork of supply requests, equipment and manpower updates, personnel reviews have been dictated, but letters to Marie obviously was required to be in his own hand writing. Especially when these words maybe his last. There was a light knock on the tent pole, followed by a polite half second delay and then a rustle of the tent flap. Captain Patton entered the tent. The Captain was a tall man, well over 6 feet, and between his boots and his helmet, he touched the cross bars of the tent. Under his orders, all of his men wore helmets all the time when in the field. And he led by example. General McIntyre thought this was petty, and in the respect to the Martians heat ray, useless, but he wasn't going to step with the Captains command chain of authority. The Captain thought it showed good discipline. The General put down his pen and looked up. The Captains salute was ramrod straight. "My God", the General thought, "The man's boots are shined, and he shaved!" He decided to return the respect in kind and stood up before returning the salute. "Sit down George." The Captain sat, placing a sheet a paper on the desk. "Sir, this is a report on the Martian Heat Fences we will encounter tomorrow. I think it should go in with the dispatches before we engage them." "Thank you George", and the General signed the bottom, and place it with the official dispatches. George then put a map on the table. It identified the boundaries of the Martian hive and had a number of red lines surrounding it. "The Tuscarora scouts have been good at identifying their locations. There seem to be a dozen of them. I don't think these are the same devices we have read about from out west. These seem to be totally passive defenses. The Scouts would move forward with sticks till they started to burn. While out west there were small automated heat rays shooting at anyone before they ever got near the actual heat fence." "Those scouts are now leading our infantry through the gaps and into the hive. From the description, the interior is full of scree, like you would see next to any factory. There should be plenty of areas for them to hide before we attack." This was the dicey part of the plan. What is known about the hives wouldn't fill a coffee mug. Out west, every single airplane has been shot down before even getting near one of the damn things. But this one seemed new, and was definitely under construction. The walls were barely 30 feet high last week, and now just over 45. Out west, they tended to get over a hundred feet. But our planes have flown overhead, and none were shot down. and what they saw was next to nothing. A single constructor device spewing dirt out one end building up the redoubt. Occasionally a Tripod would come into view, but most of the time nothing. We know there are at least 10 of the things there. 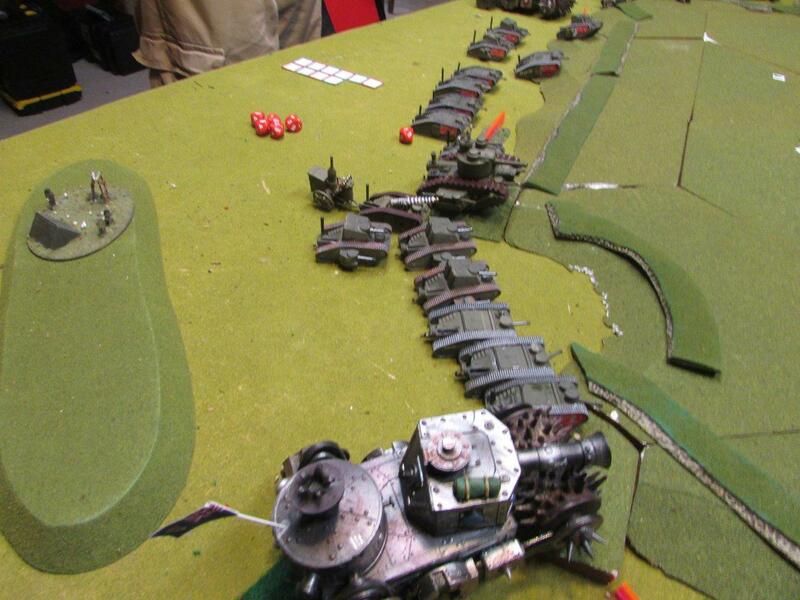 And we have far to many scouts deployed for any Tripods to have slipped away. So the infantry is to infiltrate the hive, and mark off the entry points of the Martian underground. God help them if our tanks do not arrive in time. "Thank you George, how are the men?" "Most of them are already in bed. I ordered a double ration of beer for them around 8, and that relaxed them enough to get some sleep. Though some of them visited the Canadians for an exchange of whiskey." With that, the Captain pulled out a half filled bottle and two glasses. Without asking, he poured two fingers in each and stood up. The General stood with his glass and nodded, "To victory." After the drink, the Captain departed. General McIntyre picked up his pen, and continued penning the letter to his wife. She had heard from the British Consul that he was up for some award, the "Order of the Bath", for saving the BEF from total destruction. Such foolishness. The great Martian hive of Ontario. Heat ray fencing sporadically lines the perimeter. The Martians are all underground, and cannot be seen. The newly dug hive in Ontario. A bit of explanation is required here. The interior is actually a depression, not a hill. I just didn't have the Geohex to simulate it correctly. 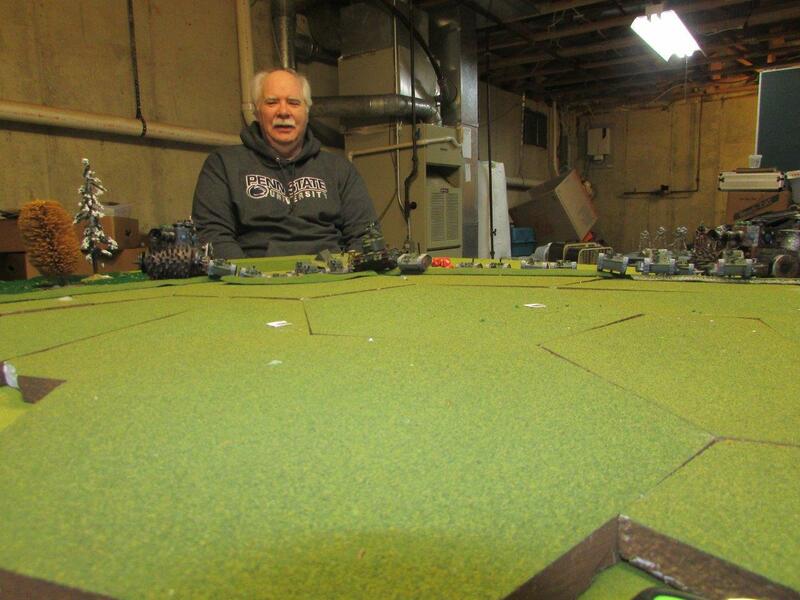 The white chips represent American infantry that has infiltrated the hive. The device on the far end represents a Martian Constructor engine. Currently tasked with throwing more dirt onto the wall. The wall is 45' high and so for all practical purposes, what is inside cannot be seen from without. The west side of the hive. 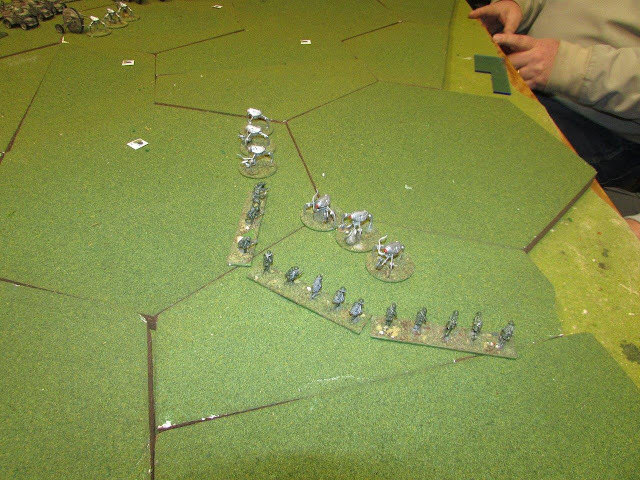 The American's use 3 command points to double move units to get close to the walls. They are supported by the huge Canadian Land Monitor, Echenais. To the north, the bulk of the American armor supported by another Canadian Land Monitor, Daphnis, and the Tesla gun. And from the east, the BEF, and a third Canadian Land Monitor, Nomia. Speed is essential for this plan to work. 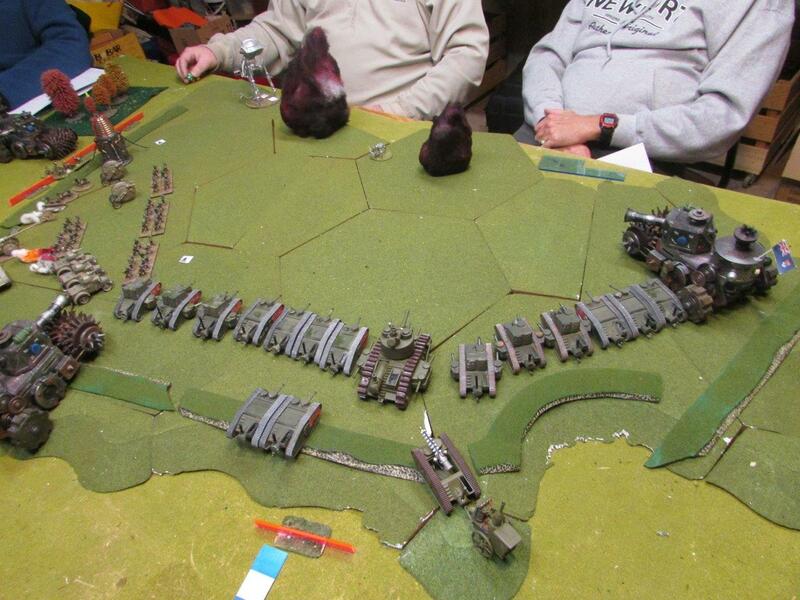 The Humans used 8 of their command points to double move troops from the table edge to close in on the redoubt's walls. 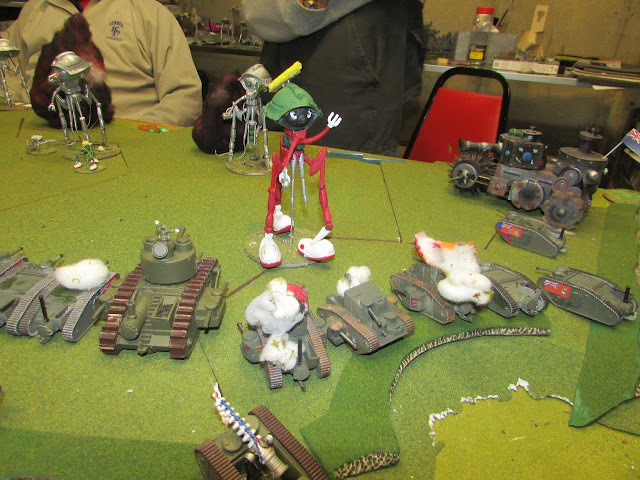 The Martian player rolls for his roving scout tripod, and it does not come on the board. First one, then two shots from the American 4 inch guns echoed the woods. Followed quickly by the firing some 50 cannons. Explosions rain upon the marked lines of the heat ray fencing. Across the redoubt perimeter, shimmering walls wink out of existence. With much of the heat ray fencing gone, the steam tanks begin to climb the redoubt walls. 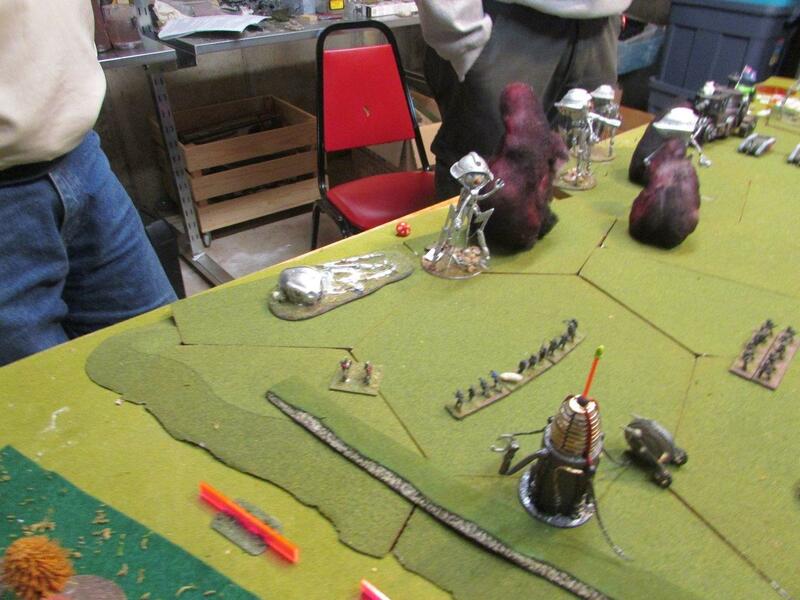 Not all the fencing falls, and some platoons will have to wait another turn to climb. The BEF had excellent shooting, and are first to ascend to the ridge-line. The Canadian Land Monitor, however was not so accurate with its shooting. This turned out to be a running theme through out the game. The Canadian Land monitors were in the thick of the fight, with guns or assaults that were +4 power, had fired some 18 shots, and their hit rate was zero. An image captured from the Martian HQ security cameras. From all angles, the humans have dared to cross the heights of the protective redoubt. With the shooting stopped, silence descended upon the field. Cleverly hidden trap doors open and swarms of automated drones pop out and assault the BEF Monotanks. Their razor sharp reaper coils tear into the Monotanks with ease. Like ants streaming from an ant hill, more Drones. Some find B Company hidden in the scree. The Martians gain the initiative and move first. 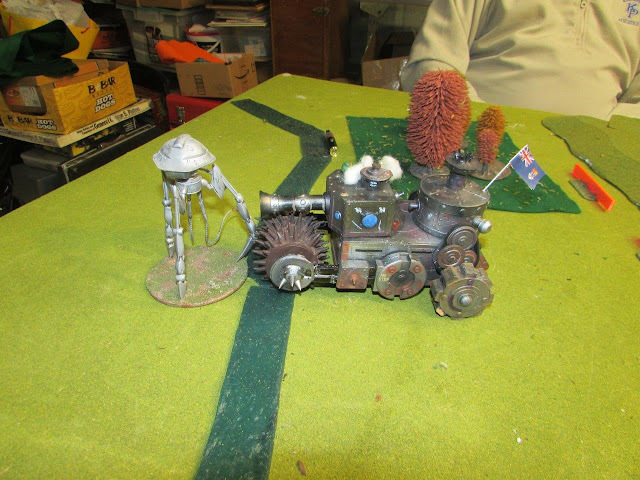 The Martian Scout Tripod acting as "Roving Patrol" arrives and takes a shot at the BEF's Coil Gun. It then retreats out of sight behind the dense forest. A note on the terrain. The entire board outside of the hive is considered light woods, while the marked forest represents dense forest. So outside the hive offers light cover everywhere. 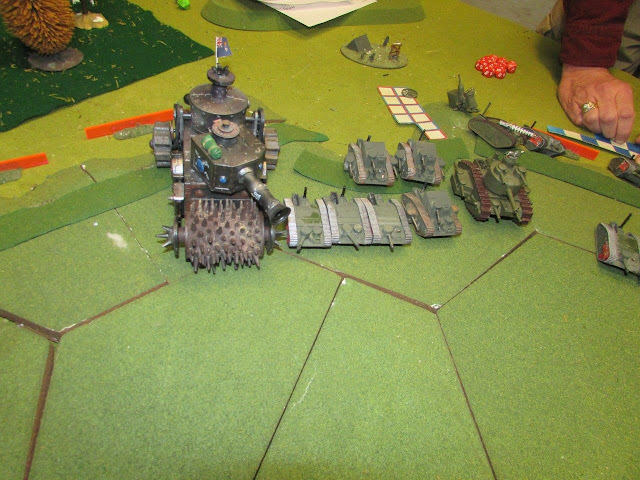 3 Assault Tripods emerge from underground. Martian Drones rip though 'B' company, and discover 'C' company, which is destroyed it as well. Having torn apart the Monotanks, the drones continue on to the Defiant scout cars. But with adroit driving skills, the Defiants manage to avoid serious damage. 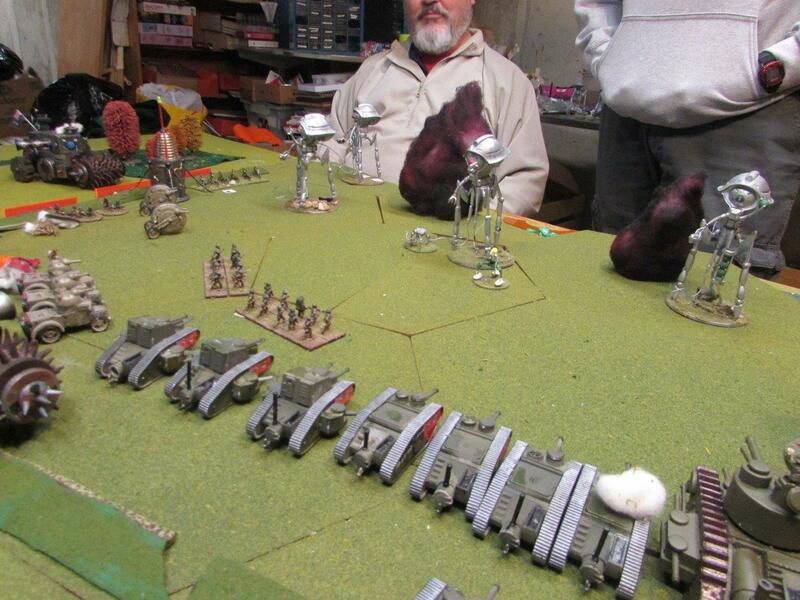 Assault Tripods sweep their heat rays destroying more Monotanks. 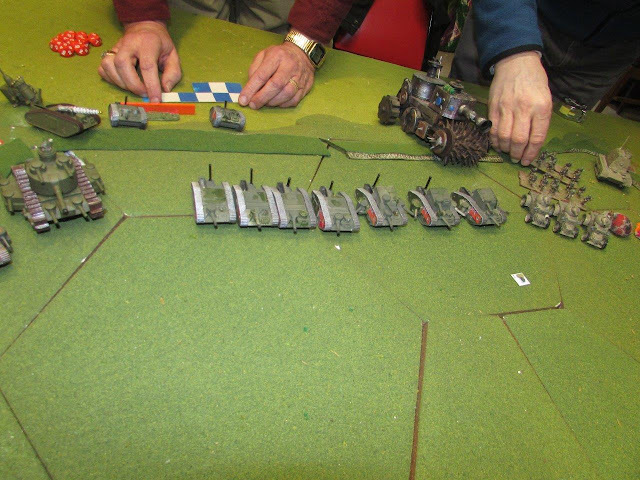 The men of the Monotanks are made of sterner stuff than their machines, as the last tanks both passed their morale checks and continue to fight. 4" guns fire from the heights. Exploding around one of the Tripods. The brave men of 'D' Company assault a Tripod with grapple and grenade, and manage to damage the giant. Also like ants, more steam tanks ascend the hill. It just wasn't going to happen. While this is probably a terrifying view from the Martian side of the board, sweeps of the heat ray can easily get 4 or more tanks under the template. The same here. 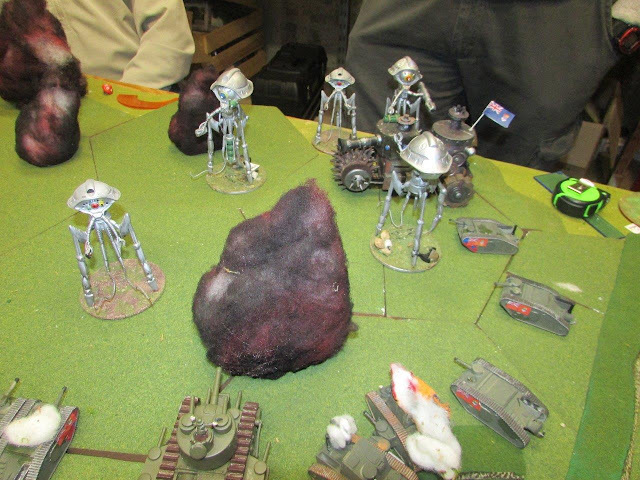 The Americans just couldn't spread out enough to avoid the heat ray sweeps. 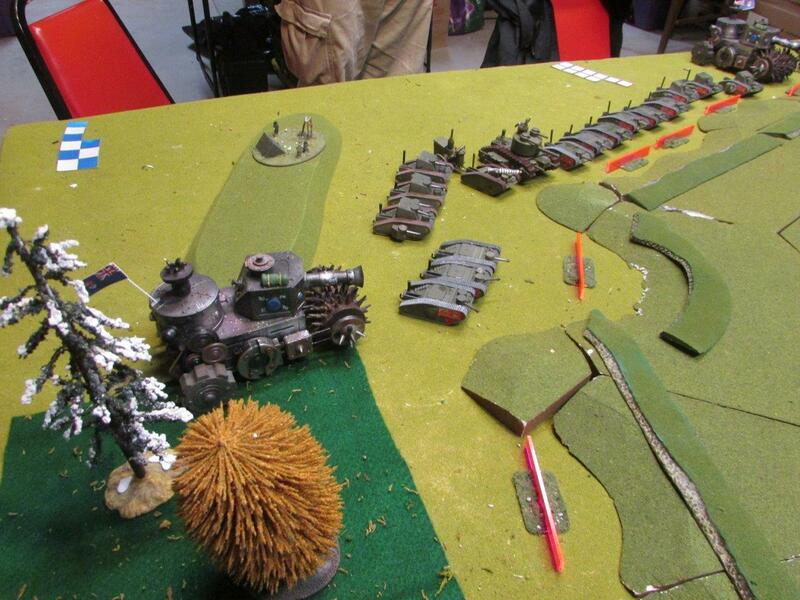 The BEF Infantry surge into the hive and annihilate the nearby Drones. The score so far. 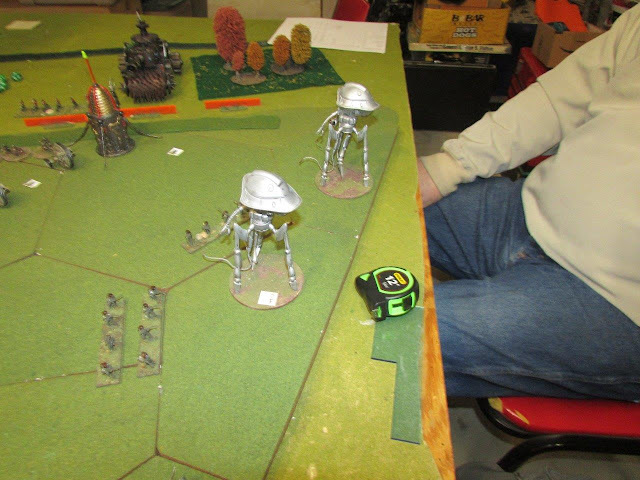 The humans have lost two units towards their break point of 14. 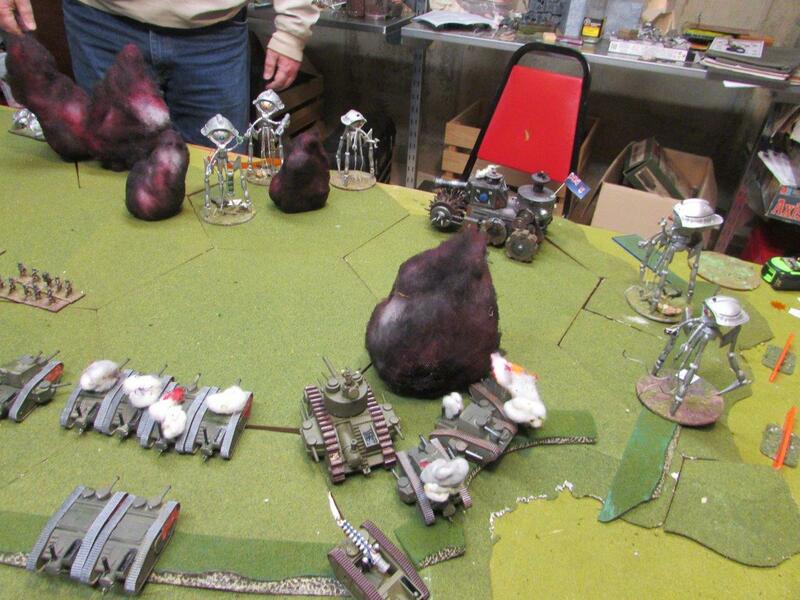 The Martians have lost one unit towards their break point of 9. The Americans gain the initiative and elect to move first. I think we can now call this the "Fish Bowl" Scenario. The sound of ululating Martians echoed throughout the base. The humans were attacking! They had already breached the perimeter, and are here! We must get to the War Machines quickly! Marvin surveyed the images of the humans already on the edge of the base, and noticed many clusters of humans already in the base, and did a quick calculation. "Mixisplitck, take my War Machine." "Because I am a coward and should be purged from our ranks. I will take your Scout Machine where I can be of some use, while you can use your fighting skills in my machine to the best advantage of our people." Mixisplitck thought this over. "You are a good Martian, Marvin. I will purge you myself when we have destroyed this attack." 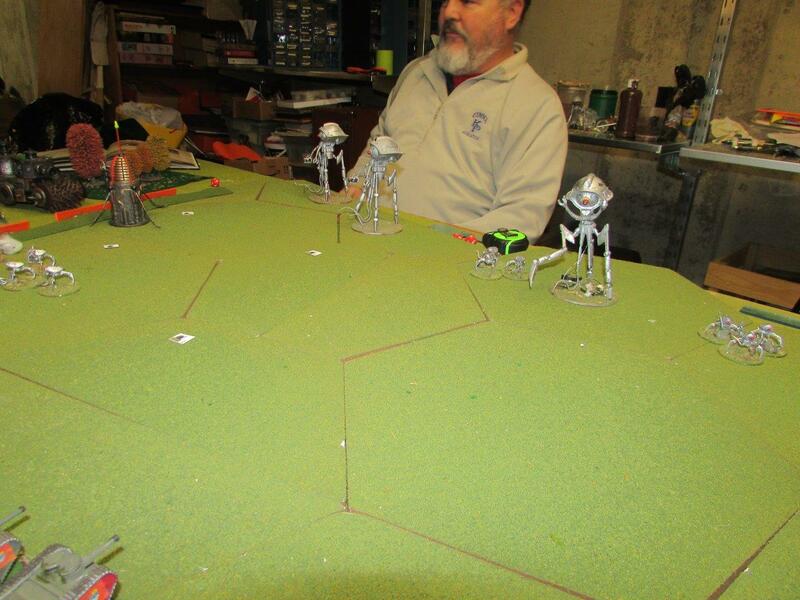 Four more Assault Tripods emerge. It is a target rich environment. Heat rays sweep to and fro seeking targets with the BEF, and by a miracle, find none. The strange Red Martian, long code named "Marvin" uncharacteristically charges. His heat ray burns 3 of 4 tanks, routing the Mk III's. It looks bad for the Martians, but if they can gain the initiative next turn, they can turn this around as just about every human unit could be touched by the heat ray. 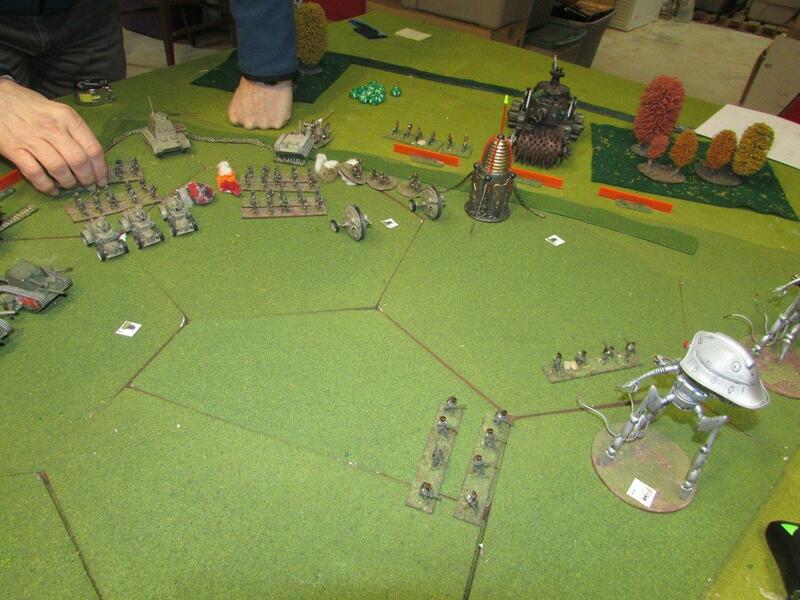 The humans have lost four units towards their break point of 14. 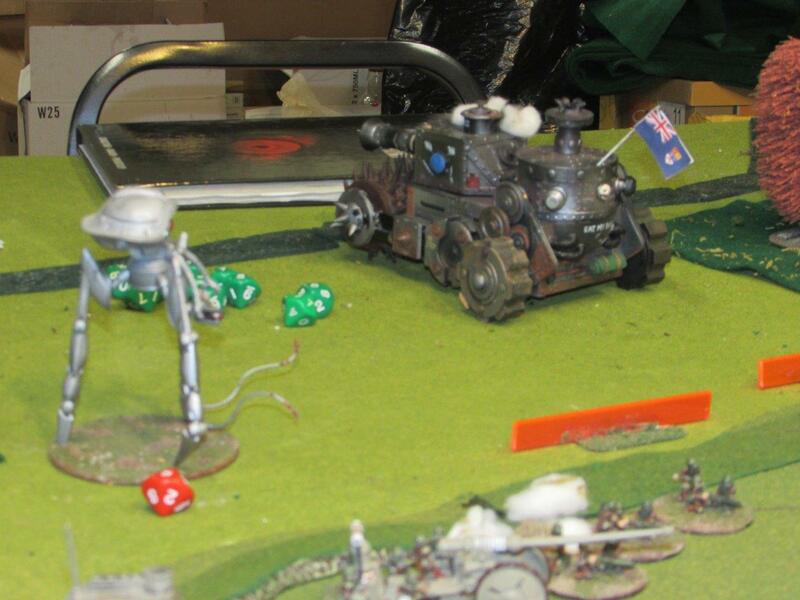 The martians have lost four units towards their break point of 9. Using a command token, Nomia charges the scout Tripod harassing her. The Tripod proves agile, and gets out of the way. This image comes to mind again. 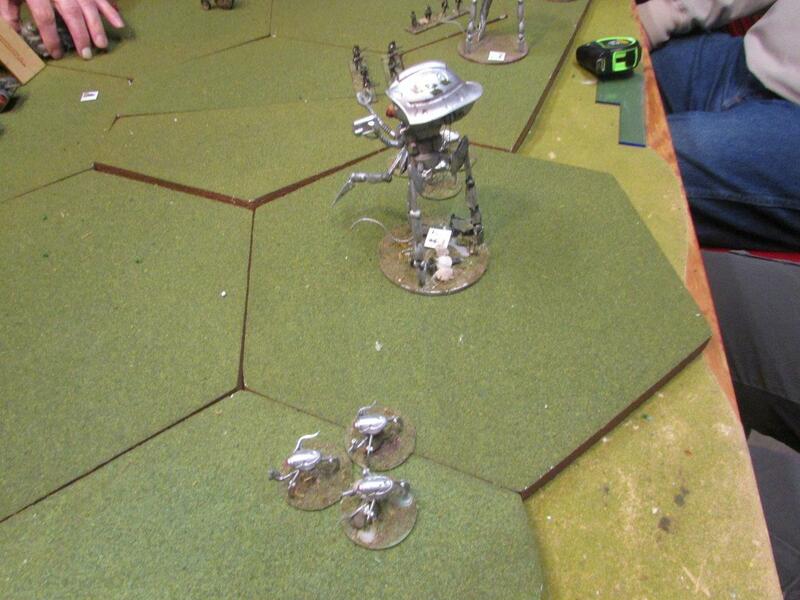 Tesla lines up a shot across the hive. Lightning arcs into a Tripod, then rearc's into the last drone. Then through a couple of Canadian Mounties, finally grounding itself in the leg of another Tripod. 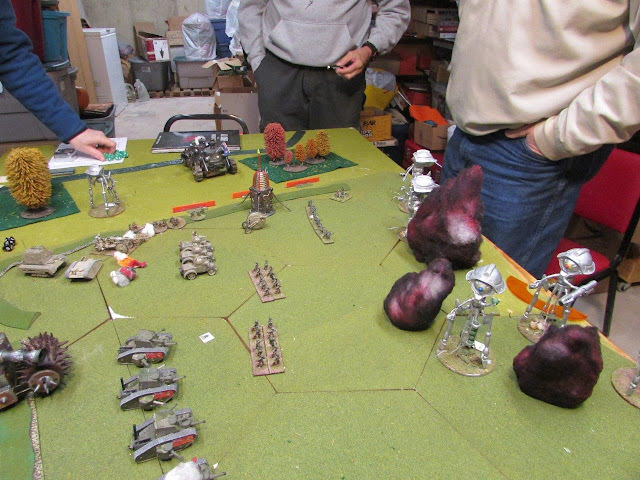 The Americans don't have much time to mourn the loss of the brave Canadians, as Patton Rapid fires his 4 inch guns, and blows Marvin all the way to Albuquerque. Yet another tripod explodes! 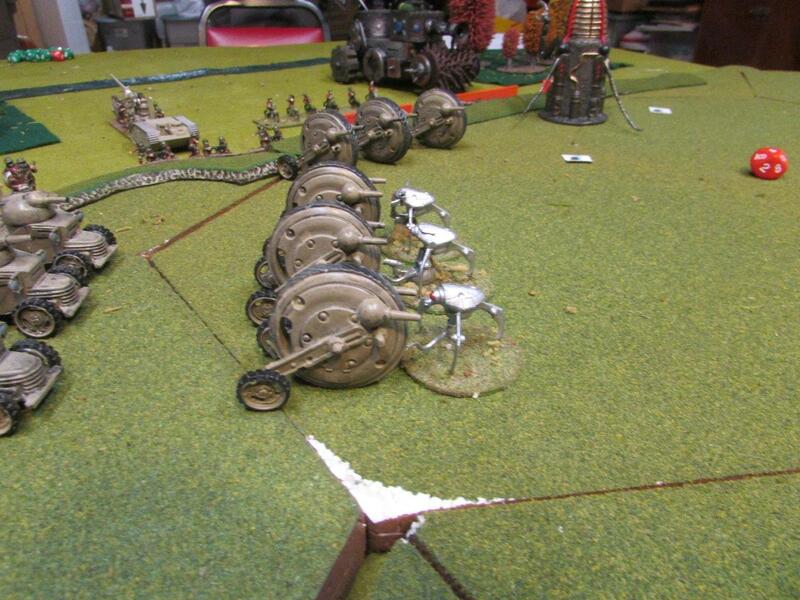 But then more tripods arrive, surrounding the land monitor Echenais, which takes a hit, but still functions. 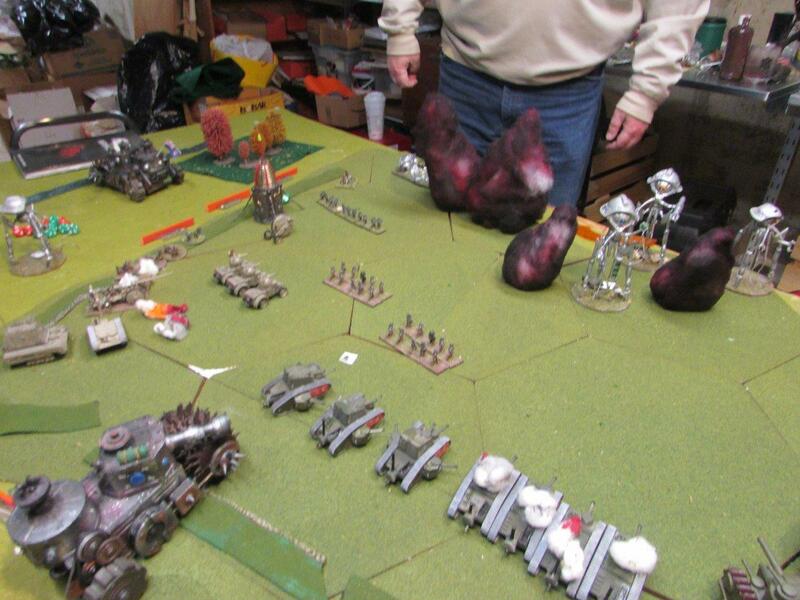 Heat rays begin to score, but the dice have not been kind to the Martians. 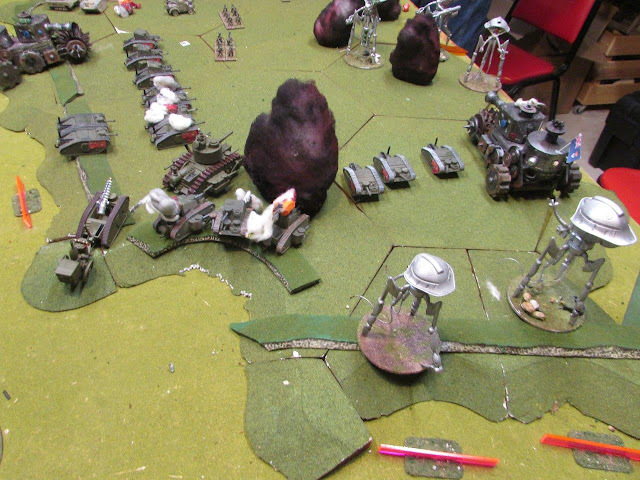 A unit of Mk II's is destroyed, and some Machine-gun squads are hit. This Scout Tripod doesn't know when to quit. 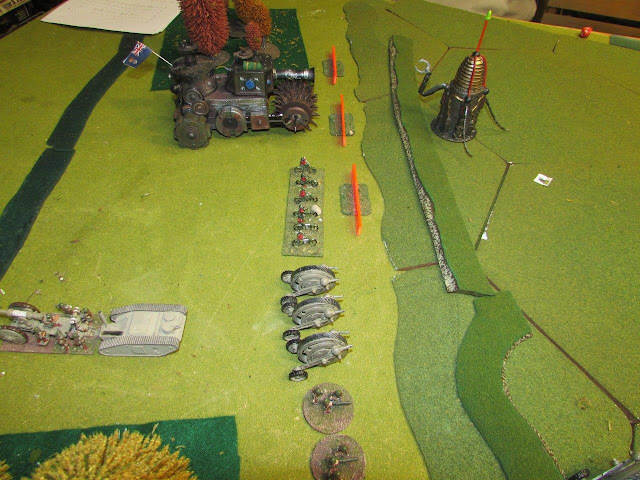 It continues to shoot at the weak flanks of Nomia (armor 7), but to no avail. The humans have lost 9 units towards their break point of 14. 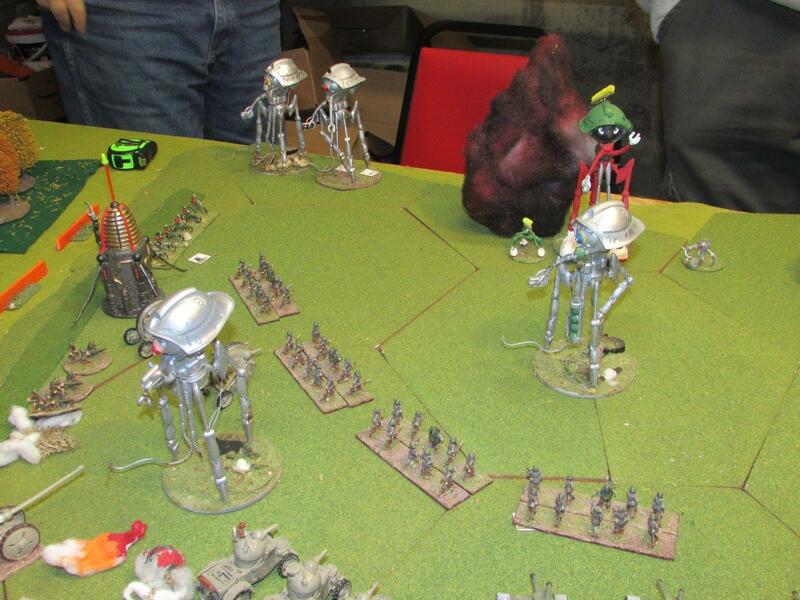 The Martians have lost 8 units towards their break point of 9. The initiative die is a tie, 6-6. Losses were even at 5 apiece (Marvin was undamaged when he detonated, so counted as 2) So the BEF spends a command point for +1 initiative, the humans will move first. The land monitors, Daphnis, Echenais and Nomia all take the first shots, and all miss. 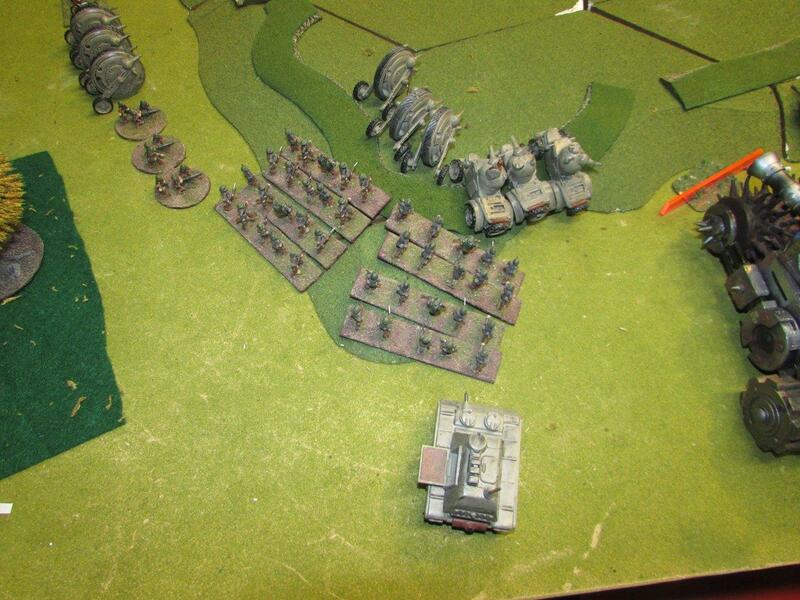 But the heavy Infantry of E Company, emerge from hiding and damage a Tripod. Followed quickly by the BEF's coil gun. A shell burst clean in the face of the thing. The hood bulged, flashed, was whirled off in a dozen tattered fragments of red flesh and glittering metal. The decapitated colossus reeled like a drunken giant; before collapsing with tremendous force..
Knowing the jig is up, other Tripods climb the ridge-line, getting ready to depart. 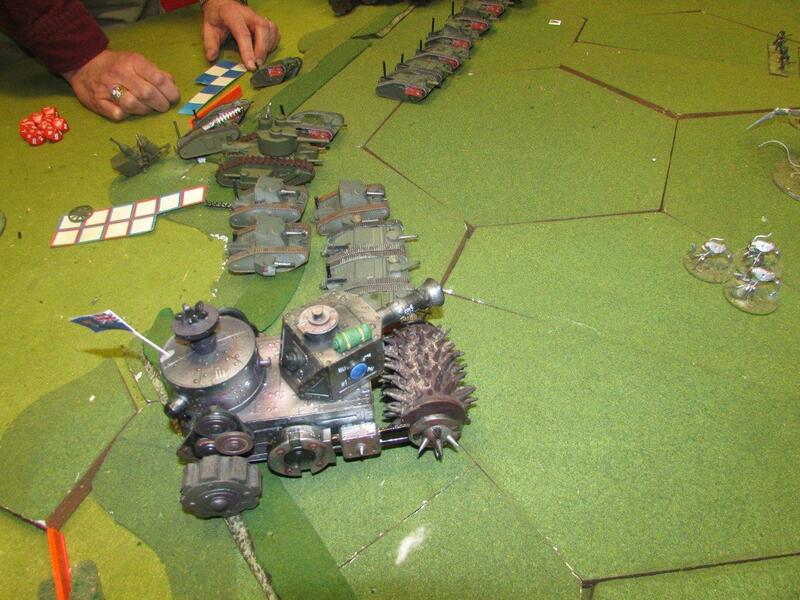 A platoon of Mk II's turns and offers parting shots. For the Americans, this was a near fight. For the BEF, this was a badly needed victory. This may be our first game where they were not routed. The cracking of wood warned the Wendingo of the approaching prey. It was fortunate, the prey as heading straight for it. The Wendingo climbed into the pile of leaves. It would leap out when the prey was close. It was a time honored way of doing things. Passed down from Wendingo to Wendingo for generations uncounted. It would not be passed to the next generation. It leaped out, shouting a terrifying growl, which caused most prey to freeze with surprise and terror. This prey was different. It did not freeze, nor did it even notice the Wendingo as a pointed leg impaled the Wendingo to the dirt. The Wendingo was lifted into the air, where it spun on the leg like a leaf fluttering to the ground. Impacting the ground again and again before finally it was left behind. As the Wendingo's vision darkened it could hear in the descending distance, "Run Away....."
We will start to use some refined rules for defining Line of Sight. Unless in ambush (to be defined by the scenario) all units can see each other if within 6” of each other. Beyond 6”, Human Steam Powered vehicles are not visible if deeper than 4” in the woods (dense or light). Beyond 6” Martian Tripods are not visible if deeper than 2” in or beyond Towering Ruins and Dense Woods, and any terrain type designated as a “Hill”. Note: The above is does not count if the hidden units have fired their weapons this turn or last. The clamp tank does not count as a unit for the purposes of human demoralization. Units brought back using American Industrial Might count as additional units. Effectively each unit brought back raises the human demoralization level by .5. They must be successfully brought onto the board for this purpose. The Towering Ruins are passable to human vehicles, at half speed, but remain impassable to Martian Tripods. When in assault combat, the defenders do not get a bonus for terrain advantages for the "to hit" roll, but do get the terrain armor advantage, if any. Macadam roads give a movement bonus to tripods. Dirt roads give a movement bonus to humans only. The cost of a Tesla Gun is reduced to 175 points. The cost of a Land Ironclad is increased to 1,500 points. Smoke areas: Human defenses can contain areas of canisters designed to throw up a large amount of smoke. Units within the smoke and up to 3 inches behind the smoke are have their defense to heat rays increased by +2. 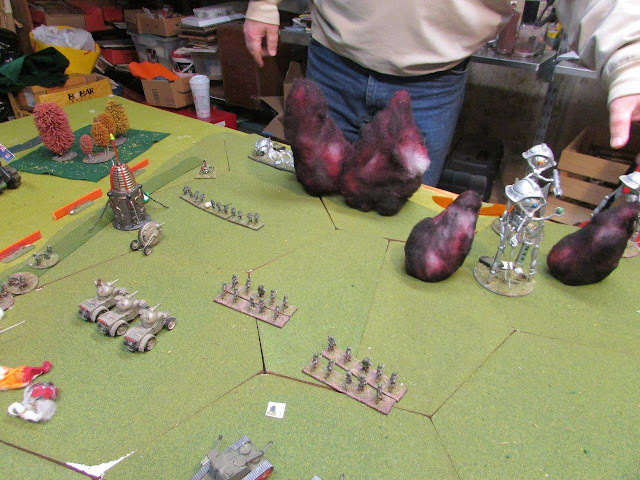 (Grenadier bombardment, Green Gas and Black Dust ignore this effect) Beyond that the Martians elevation allows them to shoot and be shot at normally. Chains obstacle: Any Tripod crossing the chain obstacle rolls a d10, on a 1 or 2, the Tripod is entangled. The roll to disentangle on subsequent turns is a 4+. While entangled, Tripods cannot move, and have their to hit number reduced to 5+. They may shoot normally. Tower guns: Tower guns have the chain obstacle sited in and get an additional +1 to hit a Tripod that is entangled by the chains obstacle (4+ to hit). 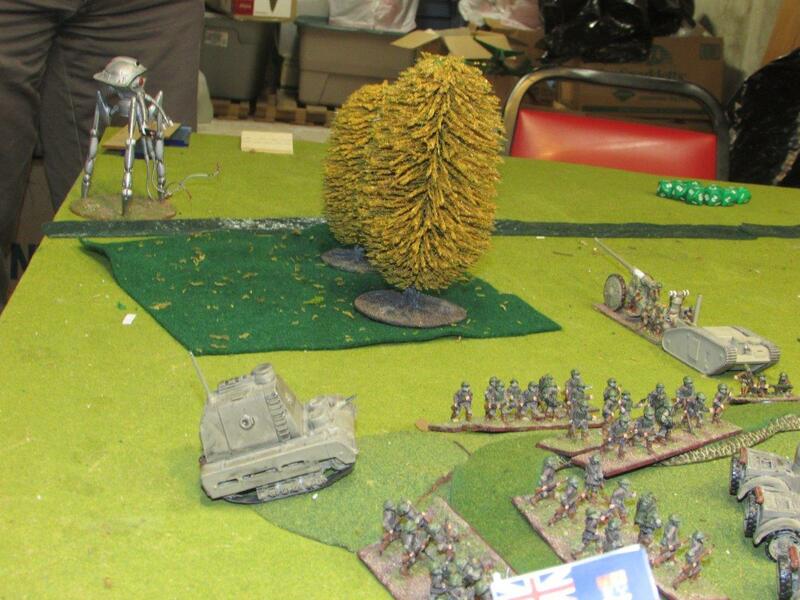 Tower guns are well camouflaged and cannot be targeted until they first shoot. After which the normal 3+ is required to hit.